The Process Model Canvas is developed by Marco Bijl, James P. Devlin and David Ruting and is complementary to Alexander Osterwalder’s Business Model Canvas. The Process Model Canvas will help you define the operating model that needs to be adopted, but HOW do you do that? In 2014 the same team published the book Value Proposition Design, with the Value Proposition Canvas as the central model of that book. The book focuses on the fit between the customer segments and the value propositions in the Business Model Canvas. The Value Proposition Canvas is again a visual tool that helps you finding this fit. 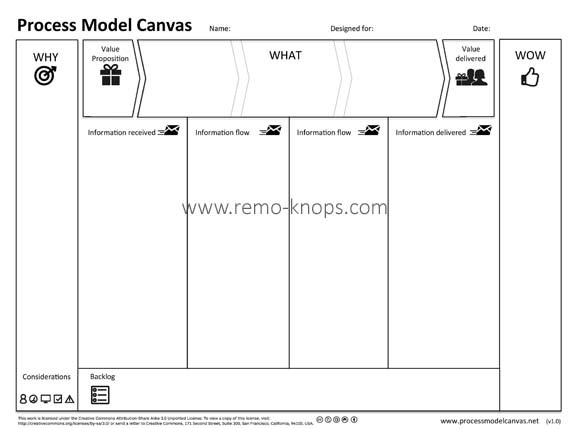 The Process Model Canvas is a plugin for the Business Model Canvas. It is a visual tool that helps you connect the strategically used business model canvas to a practical operational model. The process model canvas helps to visualize the process (key activities, key resources and key partners) and the various dependencies in the process, such as collaboration and information flow and roles involved for each process step. The section below will focus on further explaining the Process Model Canvas and how it can be used. Marco Bijl published a the video below that explains the Process Model Canvas in 5 minutes based on a practical example of two friends that start a Design Man’s Fashion Shop. In addition you might want to check out the PMC SlideShare presentation of David Rutting, which gives some more context. The approach described by Marco, James and David very much feels like when you are working with the business model canvas, however now with a focus on a specific key activity. Furthermore I really like the term “wow-effect for the customer” and reverse engineer the different process steps needed. The visual one-pager helps you iterate quickly and collaborate with others easily in this process model innovation. 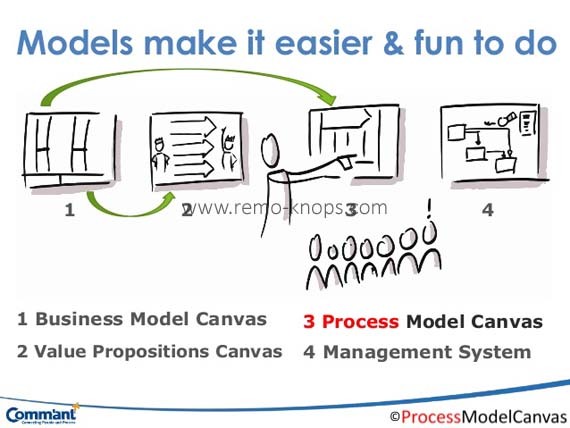 🙂 Download the Process Model Canvas one-pager in PDF-format below or head over to the Process Model Canvas website and download it from there. The Process Model Canvas, developed by Marco Bijl, James P. Devlin and David Ruting, is an interesting and valuable addition on top of Osterwalder’s Business Model Canvas. However the Process Model Canvas provides a structured approach and have a thorough discussion based on a single visual overview. Although the Process Model Canvas is not part of the International Institute of Business Analysis (IIBA) Business Analysis Body of Knowledge, it is a very practical and actionable tool to use. Personally I’m looking forward to the Process Model Canvas book that’s under development. Are you using the Process Model Canvas?